Bursting with the flavors of ham and Colby-cheddar cheese, these flaky-crusted strudels make for a great main course or an easy on-the-go eat. They also make a perfect football appetizer for game day. Thaw one roll of Phyllo, following thawing instructions on package. Preheat oven to 375⁰F. Unroll and cover the sheets with a damp towel or plastic wrap to prevent drying out. 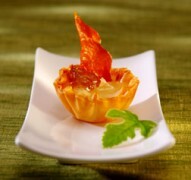 Place one sheet of Phyllo on cutting surface and lightly coat with cooking spray. Repeat with two more sheets of Phyllo. Place 1 cheese rectangle 2 inches from the long end of the strip. Add about 1 ounce of ham on top of the cheese. 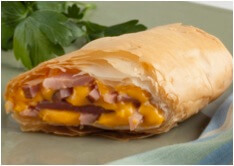 Loosely fold short edges over the ham and cheese. Then fold long edge over and roll to the end of the strip. Place on a baking tray seam side down. Repeat to make 8 strudels. Reroll unused sheets and follow storing instructions on package. Lightly spray the 8 strudels. 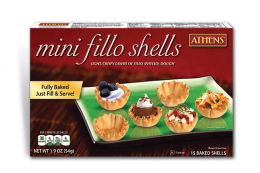 Bake for 12-15 minutes or until the Phyllo is golden brown. Remove from oven. Serve warm. Goat cheese, mushrooms and flaky Phyllo dough are the star ingredients in these light and fluffy souffles.